Turning Greek mythology into fun, action-packed Geek mythology. Made for fans of the novels, fans of Harry Potter-like teen fantasies and anyone who enjoys fun action movies made for families. After suffering a painful and disastrous big-screen flop last year with I Love You, Beth Cooper, director Chris Columbus is back on the top of his game. Being behind some of the best kids movies of all time – Goonies and the first two Gremlins, Harry Potter and Home Alone movies – I never should have doubted his potential in tackling the popular kid’s book series Percy Jackson & The Olympians. Up-and-coming Zac Efron look-a-like Logan Lerman (3:10 To Yuma, Gamer) plays Percy Jackson, a teenager who is made aware that he is the Demigod (half God, half human) child of Poseidon when Zeus drops a world-ending ultimatum and Percy is the only one who can set things right. Someone has stolen Zeus’ lightning bolt, the source to infinite power, and every god from Greek mythology believes the lightning thief to be Percy – the only child of a god powerful enough to do it. Of course, Percy is completely oblivious to the accusations – especially considering the he knew nothing of the existence of the gods until now. Absolutely sure that Percy is the thief, Hades (Steve Coogan, Tropic Thunder) kidnaps Percy’s mom (Catherine Keener, Into The Wild) and drags her to the Underverse, his hellish domain. In an attempt to save his mother and clear his name before Zeus and the other gods that sit on Athens, Percy – accompanied by his best friend, a protecting satyr, and the battle-ready Demigod daughter of Athena – set off on a quest to find three magical pearls that will allow them to go-to and return-from the Underverse with his mother, ultimately ending up in Athens. Along the way, Percy and company are confronted by several “lesser gods” who also believe Percy to be the lightning thief. Because all lesser gods desire the endless power that Zeus’ bolt offers its wielder, Percy is repeatedly attacked, adding more danger to his already dangerous quest. The story to The Lightning Thief is a fairly simple one. The intelligent, fun twists and plays on ancient Greek mythology are the things that keep you interested while watching. As Percy’s eyes are opened to this unheard-of, believed-to-be fake modern world of Greek gods and powers, so are ours – making it possible to do anything they want with the story. For example: Percy is far from perfect. Early in the film we learn that he suffers from dyslexia and ADHD. But once he learns of his royal lineage and starts training in a camp made only for Demigods, it’s explained that his dyslexia is a actually a power his mind possesses to rearrange the letters of words in other languages and have them appear in English words that he can read. His ADHD is a condition given to him to make him a better fighter in tense battle situations. It allows him to think faster, respond quicker and keep a clear mind while fighting. Percy’s weaknesses become his strengths. Because of these new fresh takes on the old mythology, the sky is the limit with cool possibilities. Although it is only rated PG, for the sake of very young children, be warned that it is quite frightening and actually pretty violent. Considering it features violent PG-13 acts like decapitation, it may not be suitable for children under 13. Also worthy of note is the exceptional cast of well-known actors who shine in the small roles they’re given. As well as already-mentioned Coogan and Keener, Pierce Brosnan (James Bond) plays a centaur (half horse, half man) teacher-like figure to Percy and the other Demigods in the “Half Blood Camp;” Rosario Dawson (Rent) plays Persephone, the goddess of spring, trapped in the Underverse as Hades’ slave; Uma Thurman (Gattaca) plays the snake-headed Medusa with stone-cold looks; and Joe Pantoliano (The Fugitive) plays Percy’s stinky, verbally abusive human step-father. Every one of them has a lot of fun with the small role he or she is given, which in turn adds to the overall fun of the film. Hopefully, The Lightning Thief will have a solid, successful run in theaters so that the remaining six novels from author Rick Riordan’s Percy Jackson series will be adapted and made in movies – it’s the perfect substitute for the almost-over Harry Potter series. 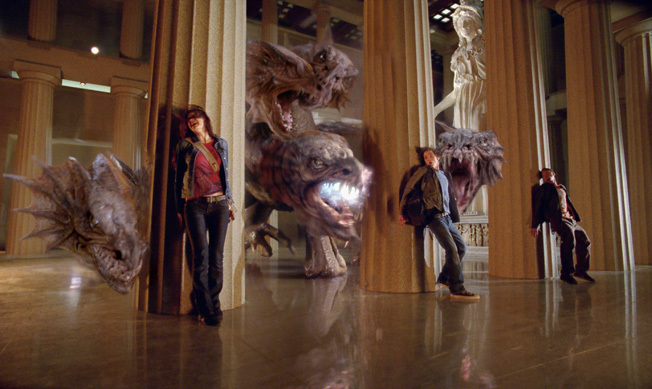 Just as Potter has done, Percy Jackson is an entertaining movie fit for everyone. Note: Do not leave the theater when the credits roll. There is a fun extra scene just a minute or two into the credits.